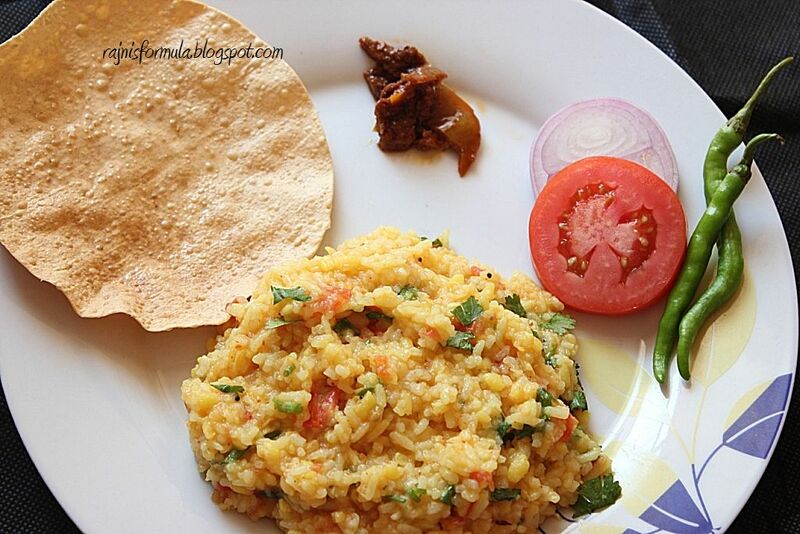 Dal Khichdi is one of the easiest to prepare with the bare minimum items/ingredients available at home. People prepare it when somebody is sick at home or when the mind goes what-to-cook-now. But I make it when I am happy :D coz the H and I both love it. Something yummy and hot on a cold day? It’s Dal Khichdi. The recipe below is the kind you get in Mumbai Shetty restaurants. 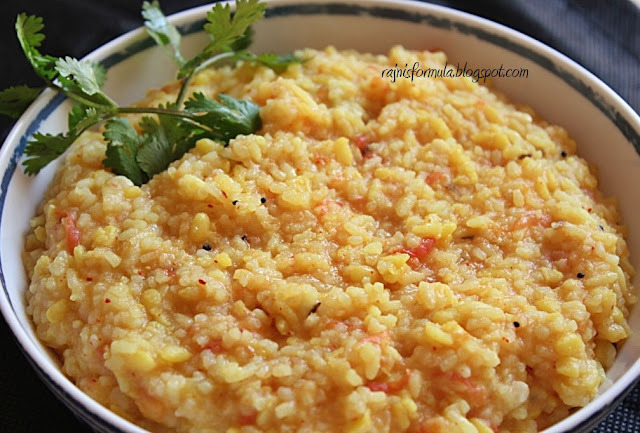 Soak moong dal and rice for half an hour prior with a ratio of 1:1 = Moong dal : Rice. In a pan/kadai, cook the rice and moong dal in 3 glasses of water, though I prefer the pressure cooker as it’s confusing to estimate the quantity that it will be once it’s cooked! Keep adding water until it's cooked. Add salt, turmeric powder, chilli powder, green chillies and a pinch of hing powder to this and allow it to boil. As the rice and dal boils, add some ghee in another pan and add some mustard seeds, cumin seeds, peppercorns, cloves, cinnamon stick. Next, finely chopped ginger and garlic, A lot would be very tasty! At this step, the aroma that fills your house will get anyone in any other room run to the kitchen to know "what's cooking?!" Saute. In a minute or so, add 3-4 chopped tomatoes and let it cook well. Add salt to taste, keeping in mind the salt added to rice and dal. The rice and dal may take time to cook well. You may squeeze a grain of rice/dal between your fingers to check. If it’s cooked well, add the cooked tomatoes to this. Garnish with a generous quantity of chopped coriander leaves. Serve hot with papad, pickle and raita of your choice and it will be heaven, I promise! We had our bellyful reading this.Thank you Rajni..